My work and life are built around keeping things as simple as possible. My continuous search for simplicity recently led me to a Japanese woman named Marie Kondo and her strange system for decluttering a home. I watched her do her thing in a video, I was amazed… and then started applying it to my life. I found The KonMari Method by accident. I saw a YouTube video called “Minimalism vs The KonMari Method” and wanted to see what it was all about. Then I went down the rabbit hole. In her native Japan, Kondo says, tidiness is a way of everyday living. She applies feng shui principles to the tenets of her tidying and ditches long-held organizational beliefs – such as cleaning little by little every day, storing items according to the seasons and discarding one item for every item brought into the home. She says that these principles, though meant to help, are the very reasons why we seemingly are never able to maintain our mess. Instead, she advocates for one epic cleaning sweep: Keep only what “sparks joy,” discard everything else, and assign a home for everything within your home. Easier said than done, right? Kondo claims that this can be done but can take anywhere between a few hours to six months. I know what you are thinking – that is a crazy time span. But let me assure you that it can be done. Marie has also written a book called “The Life-Changing Magic of Tidying Up.” If you want the book, go ahead and grab it but I was able to get started by simply watching the videos. You can continue the process through your entire home, (think kitchen, garage and bathrooms). After watching a video of Marie decluttering a woman’s closet I decided I wanted to do it. I don’t have overflowing closets full of clothes, but I do have 10x more than I need. So I pulled everything out, decided whether I loved it or not and then kept/discarded accordingly. I got rid of suits, slacks, shirts, coats, socks and underwear. I put things for sale on eBay and threw a lot of stuff in the trash. Everything that remains was put in another closet so I don’t see it. Another benefit of only keeping the clothing I love, is that now all of my clothes fit me perfectly. There is no decision needed. Just grab something and put it on. After my success using the KonMari method on my closet, I wanted to use it on my marketing as well. It’s already a very minimal operation. Just me, a few ads and landing pages and some key industry contacts. But over the last few months I’ve been testing and trying many different things, and I’d accumulated a total of abou 10 campaigns that were all running at once with varying degrees of succcess. I applied the KonMari Method by mentally taking each campaign out of the closet and seeing how it made me feel. If it didn’t include all three of those things I turned it off. By the end I was left with 2 campaigns only. It was a little tough to turn off the other 8 campaigns because some of them were profitable. But what happened over the next few days was remarkable. It’s always an eye opening experience when I test things like this. If you’re currently swamped with campaigns and aren’t sure how to handle it all, I highly suggest you do what I did. I think you’ll find that 80–90% of your efforts are a waste of time. If you want to play with the KonMari Method here’s what you can do. I recommend you start with your closet, because that’s the cornerstone of the system and will teach you how it works. If your closet is overwhelming, start with your junk drawer. Or just your socks and underwear. After you finish, see how it feels and then start bringing the method into other areas of your life. If yes, fold and keep. I know it sounds a bit silly… but it really works. If you want to clear the clutter from your life, The KonMari Method may be the way for you to do it. I’ve used it recently on my closet and in my business with success. I can’t explain exactly why it works, but I can say that eliminating the clutter from my life feels better. I recently made an interesting and accidental discovery. If you’ve been following me for a while you probably already know that I’m mainly into music and affiliate marketing. I also spend a lot of time looking for ways to deal with a crushing and crippling depression that haunts me every day of my life like an annoying and unrelenting Ghost. Today I’m talking the Depression part – and another way I’ve found to deal with it. The funny thing about Depression is you never know when it’s going to hit. One day you’re fine, enjoying life and feeling great. The next day you’re in a coma and can’t get out of bed. It was on one of these coma days that I was laying in bed feeling awful and digging through my iPhone for fun. I came across my iPhone’s Health App by accident. It showed up when I was typing in the search box, looking for something else. It’s bright orange and has beautiful analytics so it caught my eye. I opened it up and what I saw blew my mind. It also made a lot of sense. The Health app runs in the background, whether you want it to or not. It logs your steps. So every time you take a step, the phone jiggles and the Health app tracks it. Some days, my steps were high, 8,000 or more. Other days were very low… 200 or less. On this particular coma day I had logged only 200 steps. That was pretty much walking to the bathroom, to the kitchen and back to bed, I planned to take a slow bath in my bathroom since I remodel it with http://bathtubrefinishingpro.com few days before, but I didn’t have the energy to do it. I thought back over the previous few days where I’d felt better and had a good time and wondered what my steps where on those days. Each of those good days had 7,000 – 10,000 steps logged. As soon as I realized what was going on, I got out of bed, put on my shoes and went for a walk. Sure enough, as soon as I stepped outside I started to feel better. The sun was shining and birds were chirping. Homeless people were yelling about the Government being run by aliens. I felt a little better with every step I took. I kept going until I had about 4,000 steps logged and went back home. I’d figured it out another little piece of the puzzle. Number of steps = level of happiness. On the days where I’d logged 10,000 steps I was out and about. I was spending time with friends. I went to a comedy club, or met someone for coffee or a meal. I’m out there Jerry, and I’m llllovin’ every minute of it. That makes sense, because I’m also pretty sure that the number of people I see per week also has a big impact on whether I feel good or not. Every conversation, new surrounding, people watching session, handshake and hug adds another little piece of happiness. I don’t think humans were meant to spent more than a few days alone at a time. But socializing can become exhausting and I don’t want to be out and about every day. So I’ve been “faking it”. On days that I don’t feel like being around people I make sure to get about 10,000 steps anyway. 8000 at a minimum. Doing this ‘mimics’ the activity level I would have if I were out being social. So far it seems going through the motions like this works pretty well, but not was well as actually hanging out with friends. One day I hit 13,000 steps. That was a really great day. It definitely helps. Movement is definitely part of it. I’m no doctor, but it works for me. Maybe you can try it too. 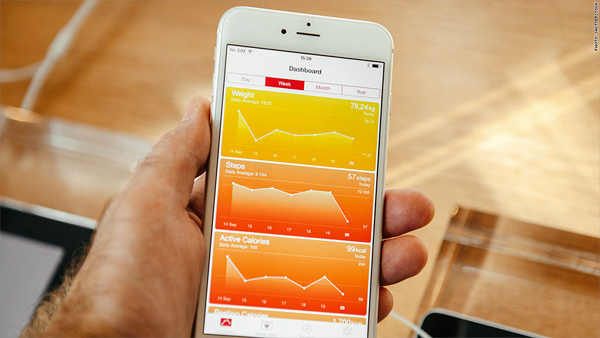 First, pull out your iPhone and search for the Health app. With any luck it’s already installed and tracking. If not, make it so. If you don’t have an iPhone use whatever your phone uses. MyFitnessPal also tracks your steps if you have it turned on. 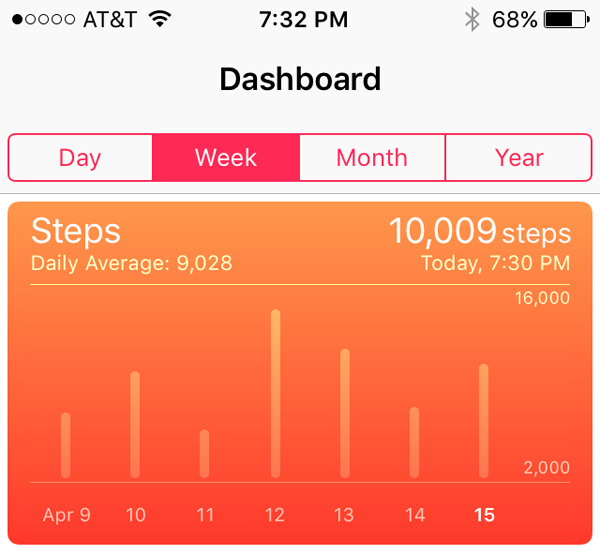 Ok, now that you have your app ready, here are a few ways to get more steps per day. By the way – I only worry about number of steps. Don’t get caught up trying to track stairs climbed, walking vs running, etc. or it gets confusing and becomes hard work. Morning Cardio. Every morning I do 10–20 minutes on the treadmill in my building. It gets my blood pumping, wakes me up and burns a few calories. A normal session gets about 2000 steps. I listen to music or check social networks and the session is over before I know it. If you don’t have a treadmill, go outside. 30 minute walk. Every afternoon I go outside, set my phone alarm for 15 minutes and start walking. When the alarm goes off I turn around and walk home. This gets another 2000–3000 steps. Smoke breaks. I don’t smoke cigarettes, but I’ve been taking smoke breaks. Every hour or so I step outside and wander around a bit. This adds another 500 or so steps to the day each time. Be Social. Go out and see some friends or family. Walking to the car, into the restaurant and moving around throughout the evening can add another 1000–5000 steps depending on what you do. Hiking. Wanna get serious? Go for a hike. Take off for an hour or so in a park, in the hills or just on the sidewalk. You’ll sweat, your mind opens up and you might get a little sun tan. An hour-long hike can add another 5000 steps. There are just a few ideas. The point is to just move more. Do jumping jacks if you have to. If you do a few of these on a regular basis my guess is you’ll start to feel better. I know I do. This is a recent screen shot of my steps. My average has gone from 1300/day to over 9000/day. This increase has made a major difference. And if you have a day where you don’t want to get those 8,000+ steps you can just sit at home and feel like crap. There’s no law against it. But if you do that, do it knowing that it probably won’t be the best day ever. It’s no big deal… Just get moving. Last weekend I went to the A4D Performance Summit in San Diego, CA. Hundreds of online marketers, advertisers, ad networks and affiliates came together to discuss ideas, share secrets and celebrate this crazy world that we work inside of. There were about 6-8 speakers, myself included. Topics ranged from campaign optimization and multi-variate testing (MVT) all the way to creating products and going from $0 to $500k in sales in 30 days. I wrote down about 20 lines of notes. I can’t share them all here because most speakers wouldn’t want their ideas posted to thousands of people. But I will share one insight that seems simple – but could be helpful. Run two versions of your campaign. 1 bid for Day, 1 bid for night. Could be a great test to try and an alternative to day parting or manually pausing. Hope it helps. People are posting their notes from the event inside my forum – MadSociety.net. The Summit was really incredible. Some of the stories I heard were truly next level. In affiliate marketing you have several different styles and lots of different setups. Some people are 1-Man Armies, some build teams, some create their own products and then there are the true top level guys doing things you wouldn’t believe. For example, someone there applied his affiliate marketing skills to a weird niche 2 years ago and then sold the company last week for $600 Million dollars. because if it is a competition… we’re all losing. We put together a last minute meetup for the guys from MadSociety. Everyone met up at Mary Jane’s, the Hard Rock’s cafe/restaurant and hung out. It’s always nice to put faces with names and surround yourself with like-minded people. Thanks to everyone who came out! 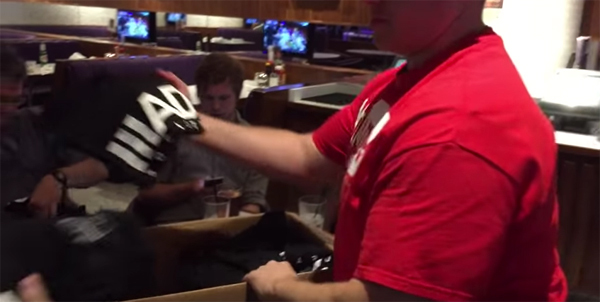 MadSociety.net member showed up with 30 t-shirts and gave them away. Also – big thanks to Justin who showed up with a huge cardboard box of MadSociety T-shirts. He flew across the country (FL > SD) with this heavy box of shirts and then gave them all away to the group. That’s some crazy effort and was a great way to break the ice brotha! I wore my tank top yesterday. I recorded some footage from the Summit and edited it together into two videos on my Youtube channel. Day 1 covers our arrival and some footage in and around the Hard Rock Hotel. Day 2 & 3 covers the Summit, the day after and the trip home. Enjoy. **Bonus: I spent about 30 minutes doing a video interview with Charles Ngo. Not sure when it will be posted but keep an eye out for that soon. If you missed the Summit this year – be sure to go to the next one when it happens. (they don’t do it every year) I always come home from these trips inspired, refreshed and full of new ideas. It’s a great way to expand your horizons, get some insider information and hang out with other people who are doing the same stuff you’re doing. Speaking of other people – it was great to see so many of you there who read this blog. I must have met 100+ of you over the 2-3 days I was there. And if you missed it, I hope the videos give you an idea of what went down. P.S. I’m doing lots of video lately on both Snapchat and Youtube. Who is A4D? They’re one of my favorite affiliate networks in the business, led by one of the best minds in the game. They focus on the big, white hat verticals that can be run long term. I’ve worked with A4D for 8 years and have never had a better business partner. As far as trust goes – they’ve never missed a payment (even when they didn’t get paid) and they’ve outlived all of the gigantic corporate networks that used to rule the game back in the day. Hands down my favorite network to work with. If you want to work with them too, apply here with my referral link.